LONDON Classic Theatre brings My Mother Said I Never Should to Taunton Brewhouse on 23rd and 24th Octo­ber. 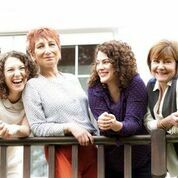 Charlotte Keatley’s play, which is directed by Michael Cabot, follows the relationships of mothers and daughters over the years. Set in Manchester, Oldham and London, My Mother Said I Never Should is a poignant, bittersweet story about love, jealousy and the price of freedom. It follows the women through the immense social changes of the 20th century, using a kaleidoscopic time structure, and focusing on four generations of one family as they confront the most significant moments of their lives. In 1940, former teacher Doris encourages nine-year-old daugh­ter Margaret to mind her manners and practice the piano. In 1969, Margaret’s relationship with her own daughter is strained, as art student Jackie experiments with her new-found sexual freedom. When Jackie becomes pregnant at 18 and has baby, Rosie, a decision is made that will affect all their lives irrevocably. Written in 1985 and first staged in Manchester, Keatley’s play is the most frequently performed work by a female playwright worldwide. Posted in The Play's the Thing on 19 October, 2018 .